There are two airports in Rome: Fiumicino and Ciampino. From Fiumicino International Airport there are different options to get to Rome (city centre) or "Roma Tre" University. The fastest way is by train. b)	the regional train to Fara Sabina/Orte (departures every 20 minutes / € 8,00 single ticket / journey takes approx. 30 minutes calling at all the main stations in the city but Termini). If you are going directly to Roma Tre University, you can take this train, get off at "Ostiense" railway station, then take the underground Line B (direction "Laurentina") from the nearby metro station "Piramide", getting off at "Marconi". The faculty of Humanities of the University of Roma Tre is just a short walk away from "Marconi" metro station. Both trains depart from Fiumicino International Airport railway station. Visit the Trenitalia website for more information: www.trenitalia.com. Tickets are sold at the ticket office inside the railway station and must be stamped before boarding. TAM srl. www.tambus.it - Bus stops in Rome: 1) Ostiense Station Piazzale 12 ottobre 1492 - 2) Termini Station ( Via Giovanni Giolitti nÂ° 10). Sit Bus Shuttle: www.sitbusshuttle.com - Bus stops in Rome: 1) Termini Station (via Marsala); 2) Vaticano, (Via Crescenzio n. 2). € 48,00 (fixed fare, including luggage) from the airport to anywhere in the city centre. If you go directly to the University the fare should be cheaper (approx. € 30,00), but ask before boarding the taxi. The University of "Roma Tre" has different branches around the city, so make sure you specify Via Ostiense, 234 (near Viale Marconi) when you state your destination. Taxi ranks are located outside all terminals. Do not trust 'private' taxi drivers approaching you. Avoid the City of Fiumicino taxis, which have different fares and will charge you € 60,00 to go to Rome. Licensed taxis are white and carry a yellow and red ribbon on both sides, plus a sign with the emblem of the city (SPQR) and the car matriculation number on the front doors. Tips are not compulsory, but you can round up the fare. There is no train service from Ciampino International Airport to Rome. The fastest way is by coach. € 30,00 (fixed fare, including luggage) from the airport to anywhere in the city centre. If you go directly to "Roma Tre" the fare will be more expensive. Roma Tre University has different branches around the city, so make sure you specify Via Ostiense, 234 (near Viale Marconi) when you state your destination. Ask before boarding the taxi. The taxi rank is located outside the airport. Do not trust 'private' taxi drivers approaching you. Rome taxis are white and carry a yellow and red ribbon on both sides, plus a sign with the emblem of the city and the matriculation number on the front doors. Tips are not compulsory, but you can round up the fare. BIT - INTEGRATED TIME TICKET (€ 1,50) - It is valid for 100 minutes after validation. You can buy it at ticket offices and shops (newsagents/tobacconists). Validation stamping machines are installed: on buses, trams, trolleybuses. Bus and underground tickets are sold at underground stations (mainly self-service machines), newsagents and tobacconists. Many buses also depart from Termini so, wherever you have to go in Rome, there will be an option with public transports. Rome has two main underground lines, LINE A and LINE B and they both call at Termini railway station. 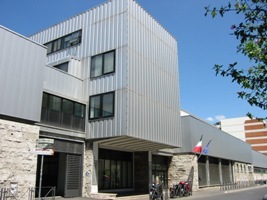 The Faculty of Humanities, where the conference takes place, is a short walk away from "Marconi" metro station (LINE B â€“ Direction "Laurentina"). Take the winding stairs as you come out of the metro station, and go downstairs to the parking lot. Walk straight to the gate on Via Ostiense 234. The main entrance of the Faculty of Humanities is right across the street, to your right. If you want to take a taxi, make sure you go to one of the official taxi ranks outside the railway station and do not trust 'private' taxi drivers approaching you. Licensed taxis have a meter inside that should always be on (it usually starts from € 2,00 or € 3,00). Tips are not compulsory, but you can round up the fare.